Why would I need self storage in New Castle, DE? How much is a storage unit in New Castle, DE? The cheapest storage unit in New Castle, DE is $49.00 per month. What size storage units do you have available in New Castle, DE? In New Castle, DE we have sizes that range from 5'x5' to 10'x20' to suit your storage needs. How much is it for a 5'x5' storage unit in New Castle, DE? The cheapest 5'x5' storage unit in New Castle, DE is $49.00 per month. New Castle is a small city on the Delaware River, about 6 miles south of Wilmington. Covering less than 4 square miles and home to just several thousand people, it's a cozy, tight-knit community with a lot of history. New Castle includes a handful of small neighborhoods within its limits, and several larger communities outside its borders also unofficially call themselves part of New Castle. New Castle has a unique and interesting history stretching all the way back to the 1630s. Swedish and Dutch settlers disputed the land, with the conflict beginning in the 1630s, when Peter Stuyvesant, the governor of New Netherland, built Fort Casimir. In 1654, the Swedes in the area captured the fort and renamed it Fort Trinity. Just a year later, the Dutch recaptured it, seizing control of the entirety of New Sweden. The Dutch designed a grid system of streets and designated the town common area as "The Green," a space that still exists today. Over the next few decades, the area continued to change hands several times. The English took control of the colony in 1664, declaring it the capital of their New Delaware colony. However, true to New Castle history, it flipped hands in 1673 and again in 1674. Throughout the centuries, the town grew and thrived. It had a prominent role in the country's early history, acting as an important seat for the colonial government. In addition, due to its location on the Delaware River, it offered easy trade and travel. However, by the mid-1800s, New Castle's growth and development hit a snag. The major railroad had bypassed the city in favor of a stop in Wilmington, majorly slowing down New Castle's growth. Although this proved challenging for residents at the time, it had the unique side effect of preserving much of the city from modernization. 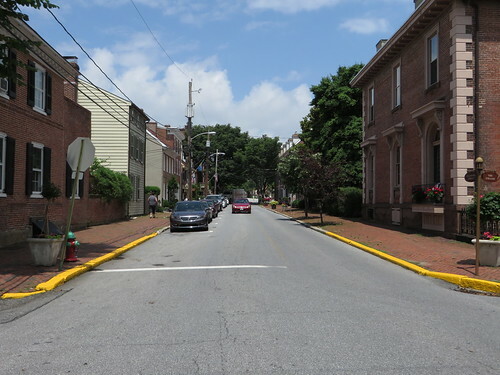 For that reason, you can still see many colonial-era buildings dotting the streets of New Castle, with historic buildings dating back to the 1700s. One of the most unique aspects of living in New Castle is the city's distinctly historic feel. Cobblestone streets and colonial-era buildings are common features throughout the area, and it's among one of the nation's best preserved examples of American history. Extensive preservation efforts have allowed a number of historic structures to live on and serve modern-day purposes. New Castle is different from many of the country's historic communities because it still serves as a residential community to an active population rather than a series of museums or empty historic buildings. You'll have the opportunity to live in a home that has witnessed many historic moments, which can be exciting if you enjoy the idea of living in a house with distinctive character. It's important to know that if you do purchase a historic home, you'll likely need to work with the preservation team if you want to complete any renovations or restorations. They can support you in making changes that stay true to the building's history, architecture and original design. Schools in New Castle are part of the Colonial School District. There are a few private schools within city limits, with the best-known campuses including Serviam Girls Academy and Tall Oaks Classical School. Utilities: The New Castle Municipal Services Commission manages public utilities in the city. Garbage and Recycling: Trash, recyclables and yard waste are collected by the city on a regular basis. You can also take advantage of additional city services including fall leaf collection and grass trimming. Transportation: DART Transit provides a public transportation network in and around New Castle. New Castle housing prices are more expensive than the national averages and rising rapidly. Part of the reason for the higher median home price is the area's historic factor, which has become very desirable. Our lowest priced units in New Castle, DE average $67.00 per month. 167 people have reserved units in New Castle, DE in the past 30 days. There are 2 locations within New Castle, DE's city limits. There are 2 locations in New Castle, DE that offer AC and Heating features.